Pre-built adjustable cyclic (i.e. repeating ON-OFF-ON-OFF) timer board modules with TRIAC output for controlling resistive ac mains loads (e.g. lamps, resistors, etc). Ideal for use in automation circuits, flashing or traffic lights, models, outdoor / indoor (hydroponics) crop growing, etc. The user can independently set both the ON time and OFF time periods using two onboard trimmers in the range of 0.3 and 60 seconds duration (see Order Code CI022 for 50 Second to 30 minute version). When powered up, the timer will activate the triac for the preset ON time. Once this time period has elapsed, the triac with turn off for preset OFF time. This process will then be repeated with the triac turning on and off for the same time periods until the timers power is disconnected. 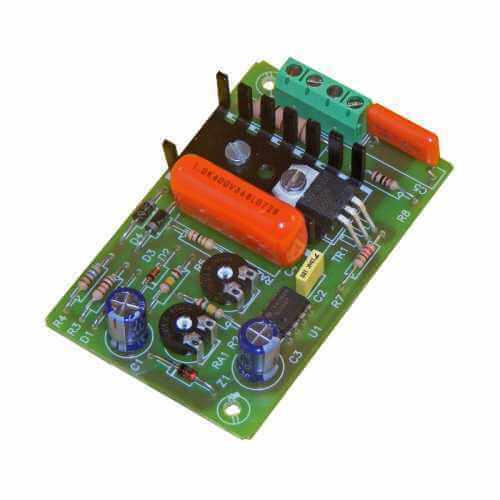 This module is NOT suitable for use with inductive loads (like transformers, neon lamps, halogen lamps with transformer, motors, pumps, etc).